In any case, it seems that there was a gradually diminishing of crew fortunes over the years. . In an effort to counter this trend, the venerable Rusty Callow, then in his twenty-third year as crew coach here, stated on March 23, 1949, “If something isn’t done soon, crew will die out as a major sport at the University of Pennsylvania.” He further went on to deplore the attitude of the university towards its athletes, as well as the river course condition in general. In response to this indictment a triumvirate of well-meaning undergraduates attempted to revive interest and participation in this time honored sport. And so it came to pass, that on April 23, of that same year, Callow Day was held to honor the Coach who had been there since 1927. 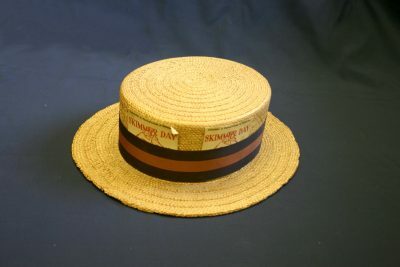 The reestablished tradition, modeled somewhat after Yale’s Derby Day, but with Quaker modification, found students again sporting beat up straw hats, Callow’s campus emblem. A skimmer is another name for a straw hat, and a straw hat this year will be the symbol of the biggest crew event in the East plus the biggest informal weekend that Pennsylvania has seen. In comparison to the plans that are now evolving from the Spirit Committee, the two previous Callow Days will be dwarfed. The All-University function will begin on Friday with a rally which will feature the crew, the coach, and the appearance of other personalities. Also planned is the annual Houston Hall cabaret dance on Friday evening. If weather permits, there will be outdoor dancing. 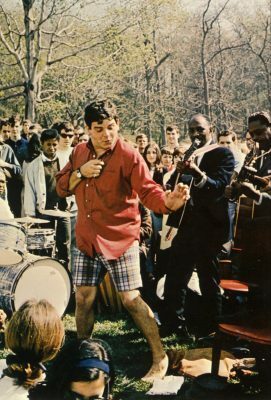 About 700 University of Pennsylvania students, 50 policemen, a couple of visitors from Washington and a six-piece Dixieland band got tangled up in a ‘rowbottom’ for over three hours early yesterday. The melee resulted in the arrest of 44 men and a girl, three injured policemen, two damaged fraternity houses, a dented patrol car, a litter of broke glass and paper in the vicinity of 39th and Spruce Streets, and a lot of bruised feelings. The “rowbottom” allegedly grew out of the celebration of the Penn varsity crew’s victory on the Schuylkill Saturday over Princeton and Columbia…..
Police began receiving calls around midnight, but the major engagement took place about 3:30 a.m. 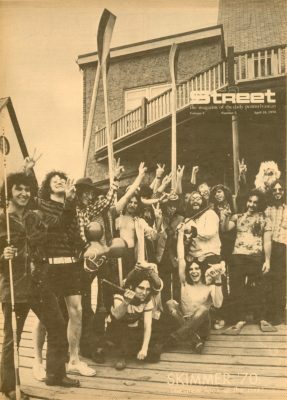 It centered around two fraternity houses, Sigma Alpha Epsilon, 3908 Spruce Street, and Delta Kappa Epsilon, 307 S. 39th Street. Police said that when they arrived to restore order, they were pelted with empty beer cans and bottles. They went into the fraternity houses and made some arrests after kicking open a few doors and breaking a few windows. You probably read the Associated Press reports last month saying that there had been a Rowbottom on Skimmer Day, April 23. ‘Twas no such thing. It was a riot. After the race, thousands of students converged on the campus. The band at Phi Sigma Delta started performing on the corner of 39th and Spruce. There can be no doubt that the band was loud, and that the students were far from quiet in their celebrations. By the time police had arrived-around 3 a.m.-the band had stopped playing, and the audience had begun to disperse. But as eight shiny red paddy wagons and fifteen cars charged through that mass of straw-hatted humanity, the interest of the approximately 700 students in staying on the corner, which had definitely begun to lag, perked joyously up again. The police swiftly became targets for bottles and other missiles, especially, they seemed to feel from the Deke house. Several of them rushed into the fraternity, dashed up to the second and third floors, and broke down every door in both hallways, hauling some students out of bed to be shoved into the waiting paddywagons…. After the 1955 disturbances, the Fairmount Park Commission and then the Penn administration began to express misgivings about the event. These concerns deepened early in the spring of 1956, when 116 students were jailed and 28 held for grand jury action as a result of another major “Rowbottom” on the Penn campus. 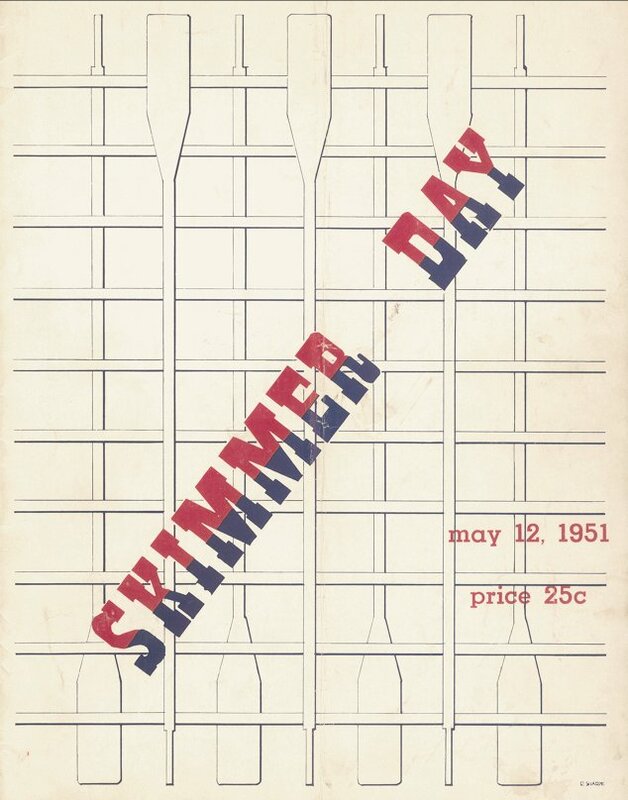 Not surprisingly, even though this 1956 riot occurred early in the spring and had no connection with that year’s Skimmer (which was actually relatively peaceful), efforts to control student gatherings increased. Skimmer Day as it has existed in the past has been removed from the University calendar at the urging of the Commissioners of Fairmount Park. Plans for shifting Skimmer from the Schuylkill River site have long been under consideration by the Undergraduate Council and the Committee on Student Affairs due to the traffic problems created on the River Drives and the desirability of making the affair more private. With the cancellation of the present Skimmer Day, committees of students and members of the administration are formulating plans for a big ‘spring weekend’ which will eliminate many of the objections to the event. Every effort is being made in connection with these plans to retain as much of the atmosphere that has made Skimmer Day one of the events in the East. The only thing which will be changed is the location and it will become possible to expand the affair when the limitations of the river location are removed. In asking for the cancellation, the Commission cited disturbances which have arisen in the past and misconduct on the part of many people who are not connected with the University. One of the conditions of any new proposal is that outsiders must be excluded except on an invitation basis. 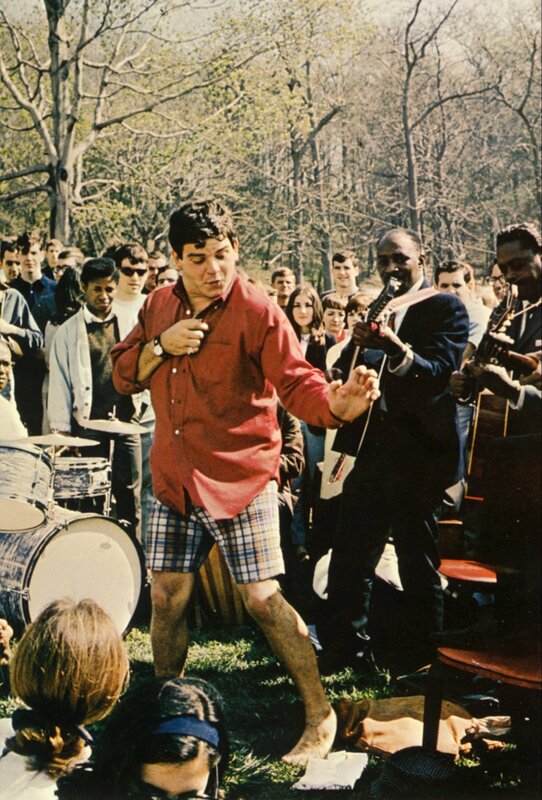 During the early 1960s, on-campus concerts during Skimmer were expanded beyond the Penn Glee Club. In hopes of curtailing uncontrolled drinking in the fraternities, a major concert was held in Franklin Field on Saturday night. The headliners included such entertainers as Louis Armstrong in 1960 and the Limeliters in 1963. Five of some 50 youths who jumped in the river to compete with the four-man canoes were arrested, and a car was unceremoniously dumped in the stream as students celebrated the arrival of Skimmer Day – opening of the straw hat season. Other parties were breaking up and the fight became a free-for-all, with about 300 young men engaged and a number of coeds looking on . Bottles were thrown, stones heaved at passing cars and cabs in 36th and 37th street. Some windows were broken. The University regrets exceedingly the series of rowdy, inexcusable, and irresponsible acts committed last Friday and Saturday by a number of University students and their guests and will take prompt and severe disciplinary action against those involved. Incidents of this type affect adversely the University’s relationship with the community, and the acts which demonstrate a disregard for the good name of the University cannot be condoned. The regrettable incidents are clearly related to the specially scheduled social events which took place last weekend. Under the circumstances, therefore, in the future, permission to conduct activities of this character will be denied University student groups. No one will deny that tomorrow is Remmiks er, Skimmer – er, rowbottom. It’s the day of idyllic joy and beer and Schuylkill and girls and police and beer and – oh yes, crew races. Ever since time immemorial this sacrosanct day has been in the Pennsylvania tradition of Ben’s two loaves, thunder mugs, ukuleles and everything else you can think of as customary at Pennsylvania. 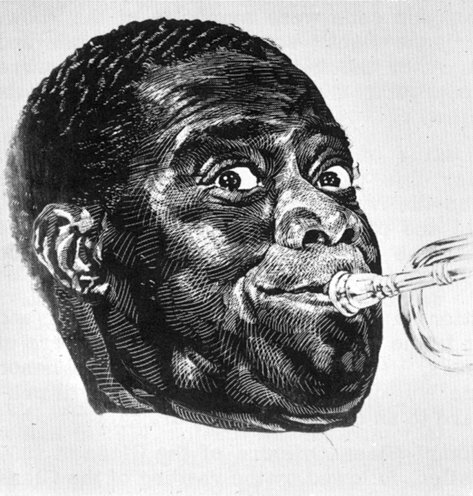 This is an exhortation to the students of the University to make the personal decision whether to Remmiks around or to act in a fashion that will not bring disgrace to the name of Penn, and the fine Penn genealogies that find it painful to go through the process of expunging arrests by the Philadelphia riot-busters. But back to Remmiks: There is little danger that either Gerry Mulligan or Bud and Travis will incite the students to riot at Friday night’s concert. Unfortunately, the urge comes from within, an ineffable, quasi-transcendental predilection to smash. It is our hope that the students will choose the more humane of the two courses offered and will refrain from rowdyism for its own sake, which has marred the spirit of many Skimmers past and last year pushed the administration so far back to its ivy-covered wall that it had to abolish such bacchanals forever. 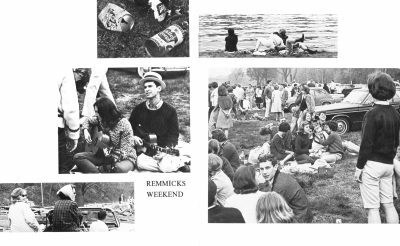 The Men’s Student Government proposal for an April 30th Skimmer weekend, highlighted by a no-beer-in-the-hand Franklin Field lawn revival is most welcome. That the Student Government has declared itself, at the outset, opposed to mixing drink with Skimmer fun is even more welcome. The MSG is going to the administration with a plan, which by its own restrictions would hopefully guarantee the safeguarding of excessive intoxication at Skimmer. This self-imposed guideline evokes memories of the infamous Skimmer of 1963, when the University, with an indirect sanction upon the use of liquor, permitted not only the use of Franklin Field for Skimmer, but somehow condemned the raucousness that followed from its own curious drinking sanctions. Few would pretend that the MSG proposal of last night flows from a purer conception of morality than the University’s. Rather it’s significance lies in the fact that students are asking not for a chance to drink, but rather for a chance to have some fun. That students are large enough to make this distinction – once the disaster of ’63 has passed off into obscurity – allows for a very hearty endorsement. During the late 1960s, as student protest swept the nation, the focus of Skimmer Day/Spring Weekend shifted more and more away from off-campus activities along the Schuylkill River to organized events on-campus. The first Spring Fling was held the weekend of April 21, 1973. Almost all of the weekend’s activities – which included carnival booths, art exhibits, and five hours of square dancing – took place in the Quad, and the concert, then gratis, featured a no-name guitarist named Dave Weinburg, who played from a chair on the grass of the Quad in front of McClelland Hall…. 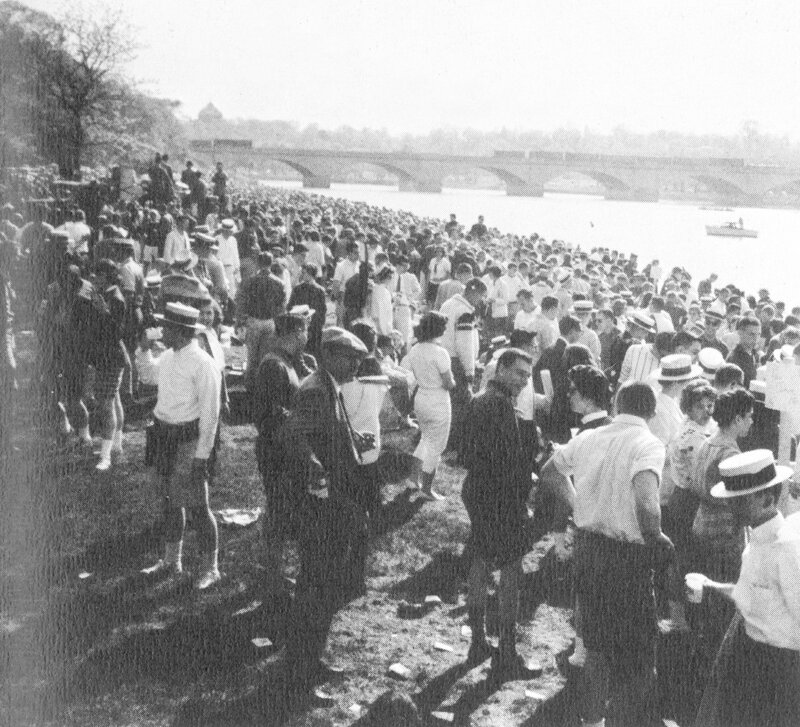 The event was originally called Skimmer Weekend when it was the weekend in April during which Hey Day and the crew races were held. Spring Fling featured a large open-air arts and crafts show in the Quad, where vendors displayed jewelry, artwork, and other wares – but there were always food wagons…. But whether it was called “Skimmer Weekend” or “Spring Fling”, the event has always been a weekend of drinking and parties. In fact, the crew races were as big a drinking event as Greek Week. -“A Look Back – Flinging Into the Past”, Daily Pennsylvanian, April 22, 1983. On September 16, 2011, the Class Boards of 2013 and 2014 partnered to create a new Skimmer experience, drawing over 1,300 students to celebrate on College Green. The revamped Skimmer event featured hot air balloon rides, food, and a Dave Matthews cover band. Students also watched the Quaker Girls dance team perform, received class T-shirts, and walked away with cartoon sketches of themselves. While previous Skimmers had been held in the spring in celebration of the crew team, Class Board moved this year’s event to the fall to balance an overcrowded spring schedule of Spring Fling, Hey Day, and Final Toast. In doing so, Class Board decided to make Skimmer a celebration of the start of the athletic season, and more specifically, the football team’s first home game. According to a Daily Pennsylvanian article from September 18, 2011, the revival of Skimmer was an overall success; it achieved its goal of promoting support for the football team and other athletic groups. The event also provided a way for classmates to reconnect as the year started.